Shak and all: You can see this merry-go-round in action in the 1958 horror flick "The Colossus of New York." I just watched the movie and thought, Where have I seen that recently? -- then recalled this thread! A Disney ride engineer used his 40 year old Erector Set to make the prototype model for "Soarin' over California" at Disneyland. Between the two links...you might be able to figure out what is missing to build your Carousel. As you already know...EBay seems to be the best source for old parts. I purchased a larrge set (#10-1/2??) on eBay several years ago and began constructing the carousel with my daughter, only to discover that the purportedly-complete set wasn't. Bummer! 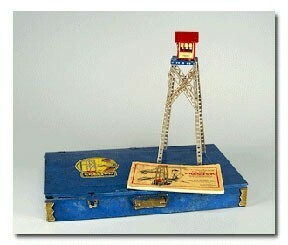 A few years back...I hauled out my 1953 Erector set and built the Ferris Wheel for the grand kids! They couldn't believe it really worked with a motor and a piece of kite string! A glaringly-inexcusable omission. Etch-a-Sketch is there now; thanks for the reminder! What happened to Etch-A-Sketch. Or don't you guys remember that anymore. These were so much fun as a kid growing up I had 3 older brothers who tauhgt me how to make things. This and Lincoln LOgs I loved hardly ever played with dolls as I played with all my brothers stuff.